Schiele’s death during the 1918 influenza pandemic, at the age of only twenty-eight, left this portrait of his friend Paris von Gütersloh (1887–1973) unfinished. Nonetheless, the work is a masterpiece of Austrian Expressionist portraiture. Gütersloh was a painter, writer, actor, producer, and stage designer, who wrote the first study of Schiele’s art in 1911. Schiele admired his friend’s extraordinary intellectual and artistic talents and sought to portray him as a creative genius. 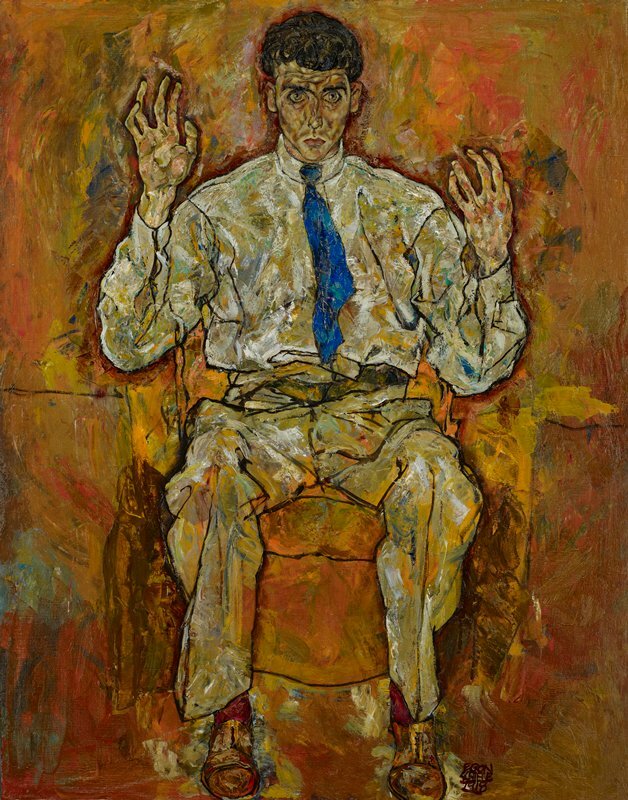 With hands raised in a gesture of both attraction and repulsion, eyes transfixed and body tense, Gütersloh is shown at the moment of artistic inspiration. Newsflash: Do you look like your name?